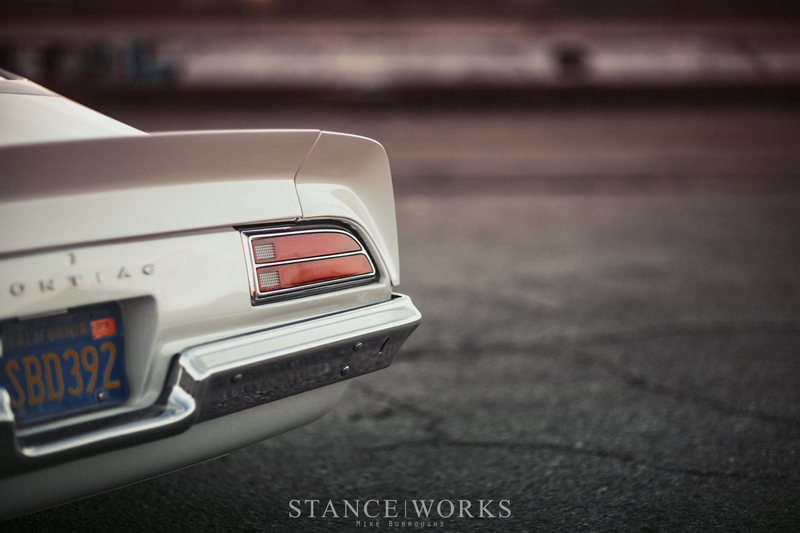 This story begins with a rusty, battered Pontiac Trans Am. It's a far departure from the BMWs Riley Stair has built his name around, although not totally unexpected, if you've ever seen the C10 Pickup he tucks away. He's clearly got a passion for the un-substitutable thump-and-rumble of a V8, having stuffed one into almost every project he's built so far, ranging from his own E28 and his dad's E24, to the Datsun 240Z, the C10, and now the T/A, too. In fact, its the V8 that represents the core of the Trans Am build as a whole. 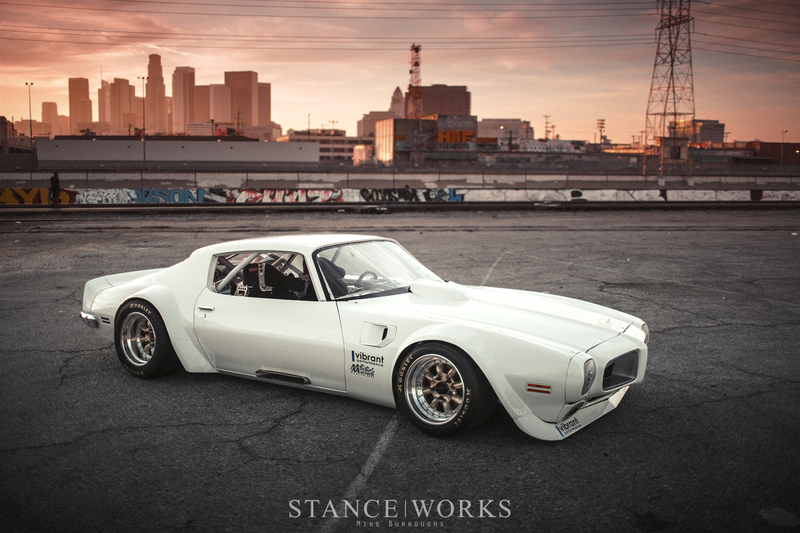 Seeking a redline of 10,000 RPM and an all-motor output of 1,000 horsepower, Riley conjured an idea of a vintage SCCA Trans Am-racer built in the modern Trans Am era. 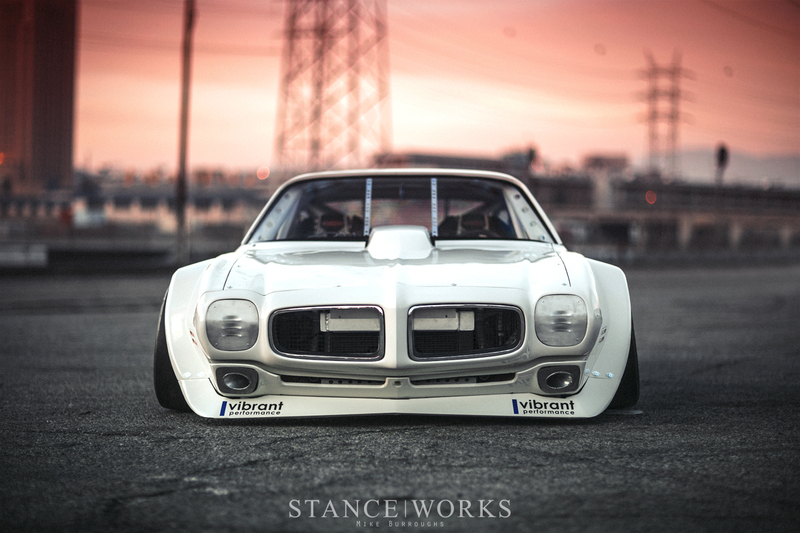 And of course, what better car to build than the iconic Pontiac that shares the same namesake? After tracking down the right example, Riley loaded the car into the 10x20-foot carport on the side of his parents house, closed himself off from the outside world, and got to work. In the 20-something months that followed, Riley gave every spare minute to his passion project. The drive home from work every afternoon was spent figuring out what projects were next on the docket, and weekends were celebrated as a pair of 18-hour stints to spend melting metal, week after week. On rare occasions, he'd lift his welder's mask to take a call or send a text, only to return his attention to the machine he was shrouding in secrecy. For two years, Riley seemingly disappeared, devoting every resource available to him to the project at hand. No detail slipped to the public, and Instagram teasers were stritcly limited to photos of tools and welds. The final product was intended to surprise, and surprise it did. The Trans Am was unquestionably one of the stars of the 2018 SEMA show. It broke the mold of what a build is, and what one single person is capable of. The finished product was built solely and entirely by Riley himself, save for the final paint. 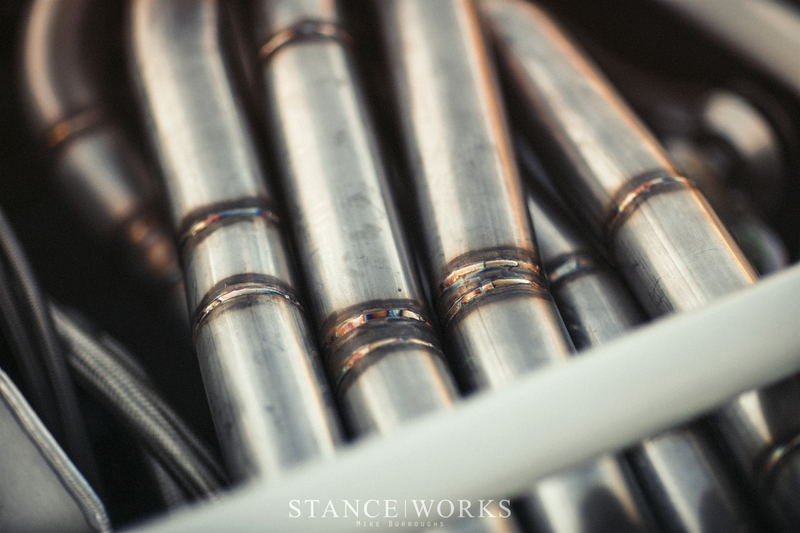 Every weld, every component, every inch of thought and design: the physical, realized signature of Riley Stair. Understandably, heavy crowds surrounded the car all week long. Passers by and photographers alike swarmed the car, making it tough to even snag the preview shots we shared during SEMA a week and a half ago. The desire to yank the car from the booth to photograph it peaked the moment we pushed the car into the central hall, and that desire failed to wane, through to the show's end. 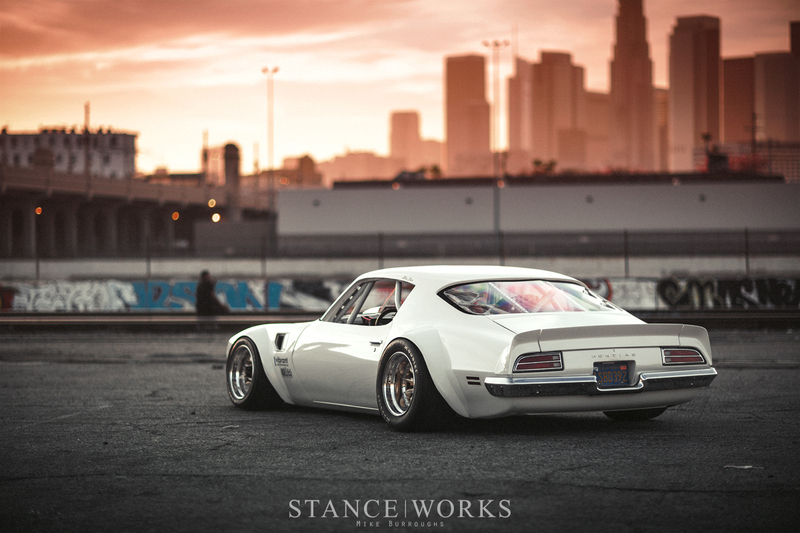 Finally, though, we hauled the car to the outskirts of Los Angeles, and did what we do best. 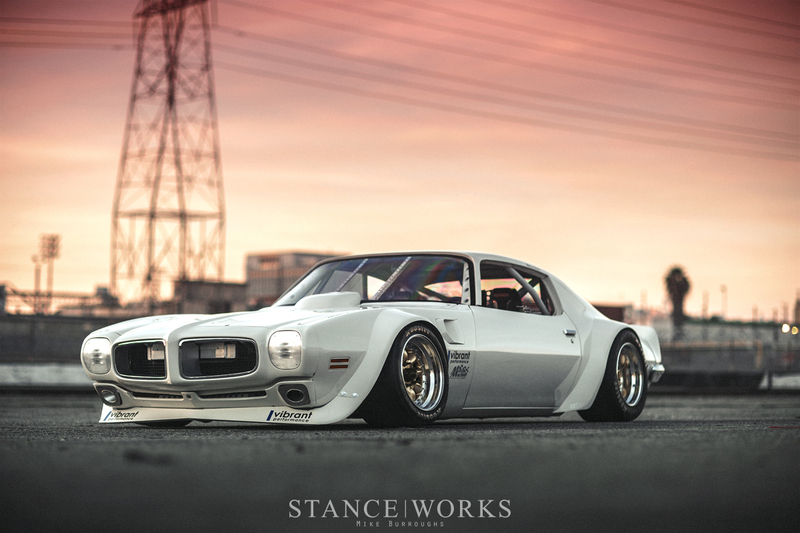 Allow me to formally introduce: Riley Stair's 1970 Pontiac Trans Am. 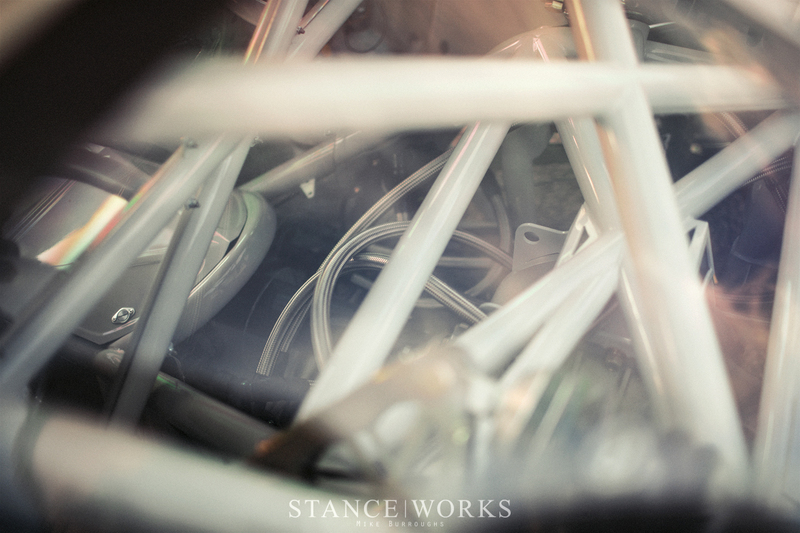 As the centerpiece of the build, it's only fair to start with the engine and its surroundings. Riley turned to Motor Machine in Carmichael, California, to build the engine he wanted. With his three requisites -- 10,000RPM, 1,000HP, and natural aspiration -- he knew Motor Machine would be equipped to build it. 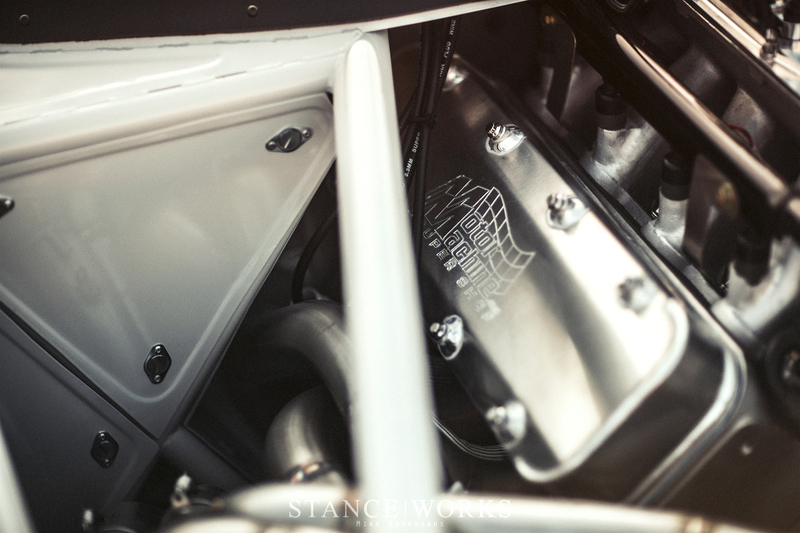 The foundation for the engine is a 400-cubic inch LSX Dart LSNext2 iron block. Perched atop the banks is a pair of Dart 368cc 10-degree canted valve heads, which have been loaded with Victory titanium valves and PAC springs with titanium retainers. Below are .970 solid roller lifters, custom tapered 7/16 pushrods, a custom ground Cammotion billet camshaft, Jesel shaft rockers and a Jesel belt drive. A billet no-drill balance Callies crank shaft, GRP aluminum rods, and ARP fasteners throughout keep the impressive build going. To finalize the internals, custom 16.25:1 compression JE pistons were built and installed. Yes, 16.25:1 compression, meaning this engine runs on methanol - or more simply put - pure, caustic alcohol. 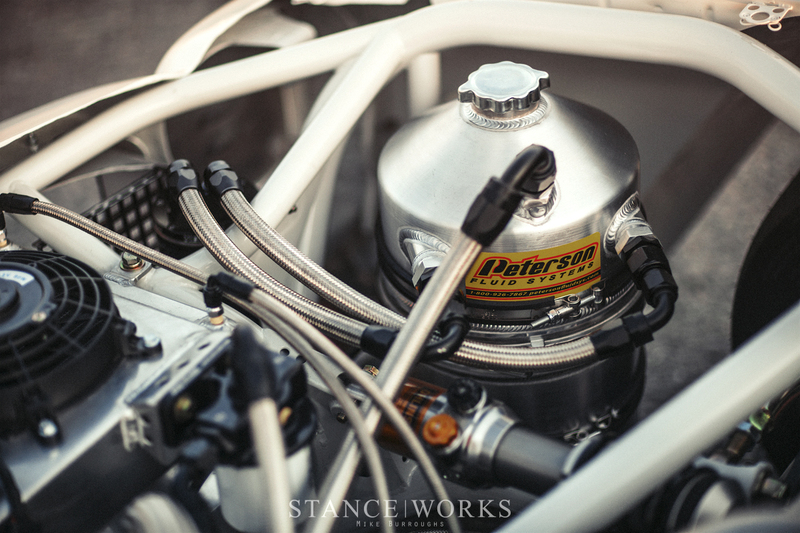 Dual Aeromotive Eliminator fuel pumps feed the fuel up an out of a custom Fuel Safe cell, through an Aeromotive filter, into a pair of Holley EFI fuel rails and out through Billet Atomizer 225lb injectors. 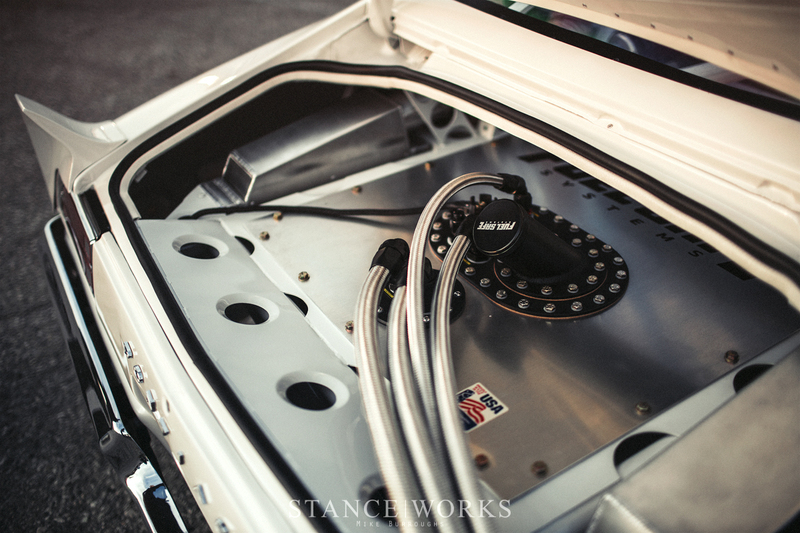 A FAST 4500series thin throttle body sits atop a custom Dart Intake manifold to supply air to the beast, and the system is controlled by a Holley Dominator ECU. All together, its a system capable of fueling and controlling such a monstrous engine build. 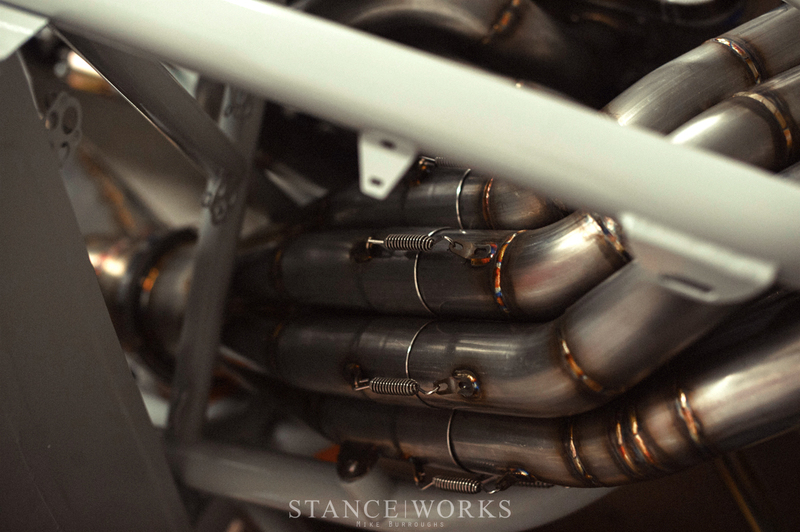 That of course brings us to the most interesting part of the engine, and perhaps car as a whole: the exhaust. Built entirely with Vibrant Performance stainless steel, Riley fabricated an immense equal-length 8-to-1 header and exhaust that exits below the passenger door. The 8-to-1 collector, built by Riley himself, merges the exhaust in the sequence of firing order, and exits with a 5" diameter that routes under the passenger floor. 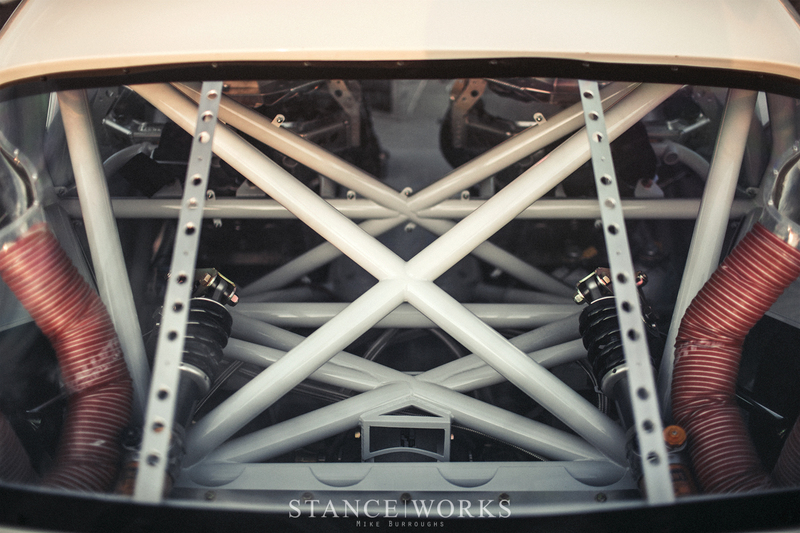 For clearance, the system transitions from 5" round to a 2x14" custom flat oval, with which it exits the car. Riley is fortunate the car sports such a long hood. 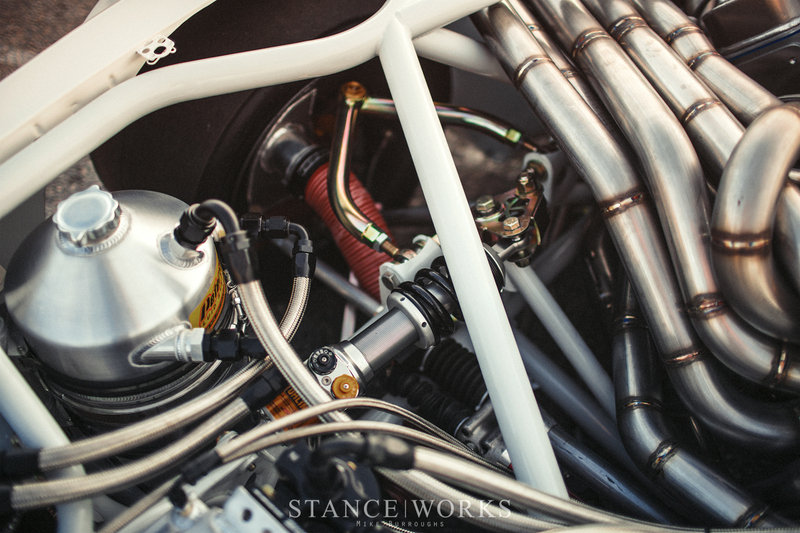 With the engine moved back a staggering 20", it gave him room to route the headers around the front of the engine, creating a showcase of twisted and tangled tube work. 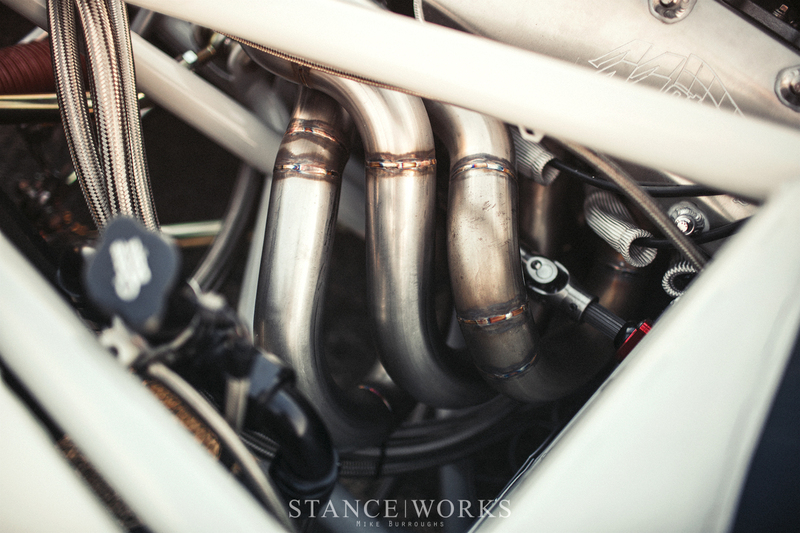 With 2.25" primaries, the medusa-like exhaust is immense in size, and the end result is easily one of the most impressive and extraordinary exhaust systems we've ever seen. The sound? Even more impressive, to say the least. 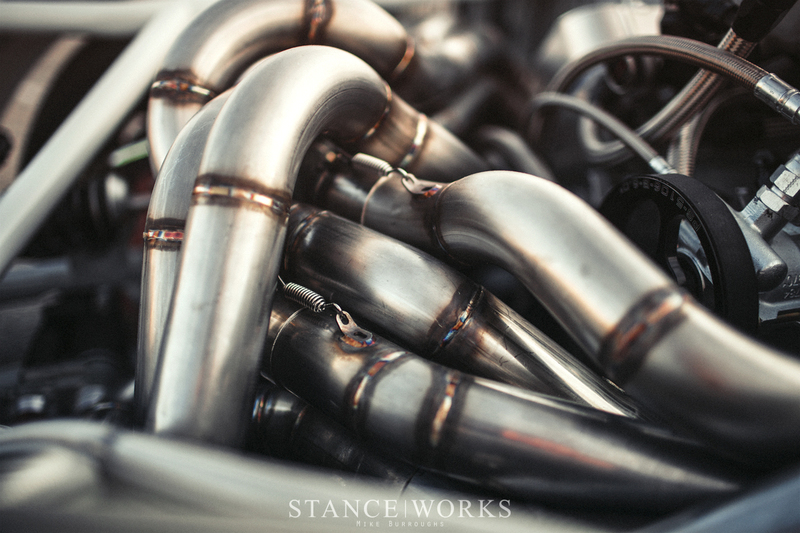 Also chasing through the engine bay, and throughout the rest of the car, is more than 300 feet of stainless AN line. Vibrant Performance lines and fittings were used throughout, which supply the car with all of its necessary fluids and cooling. Components like the 4-gallon Peterson oil tank, which feeds a 5-stage ARE dry-sump pump and remote filter housing, aid in creating a beautiful mess of hosing. Lines chase to the back of the car too, not only for fuel, but for the differential cooler and trans cooler that sit on each side of the fuel cell. At the nose of the car, a pair of Chase Bays radiators have been "V-mounted", which help as a workaround for the heigh restrictions imparted by the incredibly low nose of the car. The pair of radiators are plumbed in series, doubling the total core space for cooling capacity. A Meziere remote electric water pump is on work duty. First headers, then hosing, and now chassis tubes: a cluttered but calculated mess of tube work symmetrically chases its way from fore to aft. 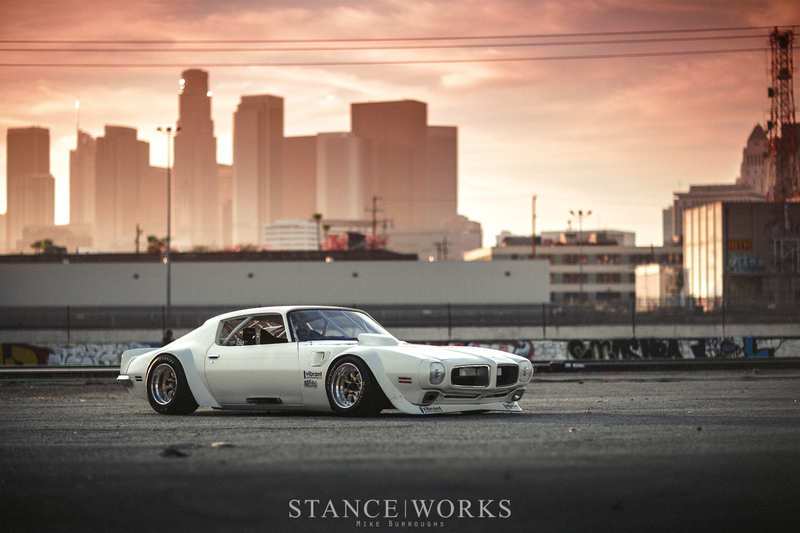 What was once a Trans Am is now merely the skin of one. 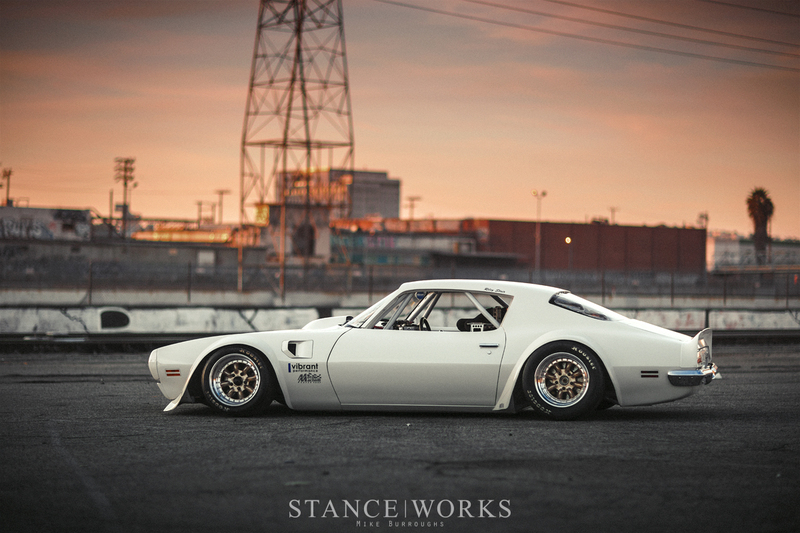 Riley set out to build a tube chassis of his own, knowing full well that the factory unibody of the Trans Am would never support the build he had in mind. 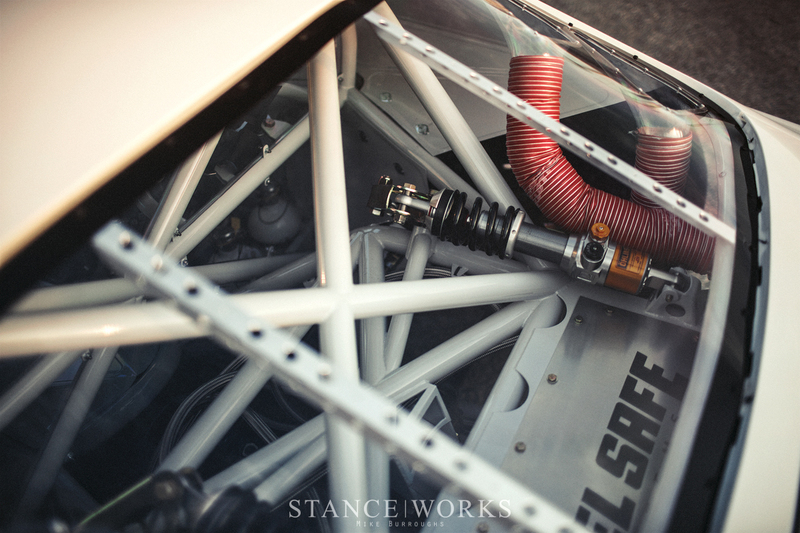 Built entirely from 1.75" .095-wall DOM tube, the chassis plays as the foundation for a one-off car, including the entirety of the suspension. When it comes to suspension, Riley turned to modern Trans Am racing for inspiration, as opposed to the car's original Trans-American roots. The solid rear axle was tossed in favor of an independent rear suspension based around a Winters quick-change differential. 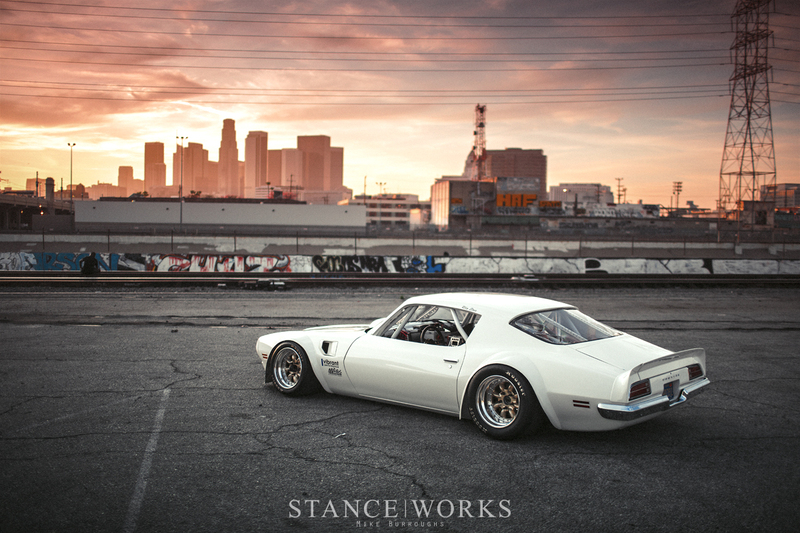 Not one to turn to anything off-the-shelf, Riley set out to design his own suspension and geometry, front and rear. Calculating the geometry to exhibit correct dynamics while giving the car a ride heigh of just 2" off the ground proved to be a bit of a battle. Constructing it, on the other hand, is where Riley's talents shined. 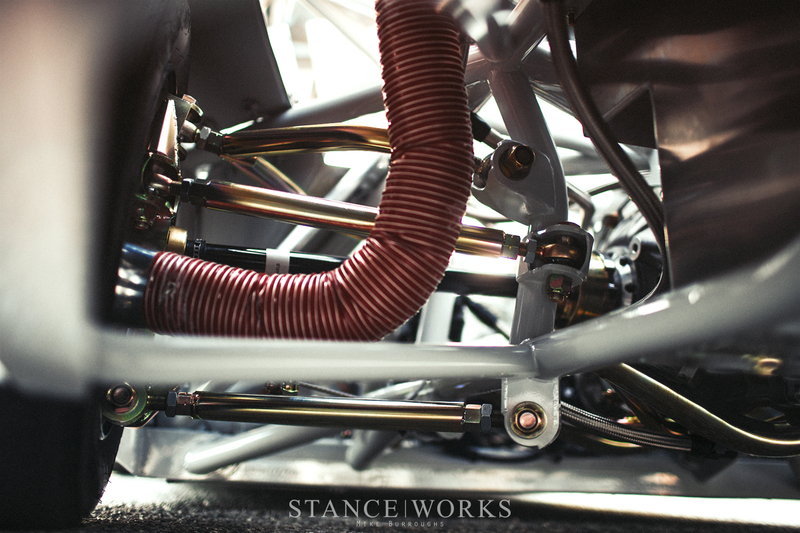 In the back, a custom cradle was built for the Winters differential, and then custom knuckles to house 5-on-5 drive hubs were built from the ground up, and completely TIG-welded, just as the rest of the car has been. Riley fabricated upper and lower control arms for the front and rear, which mate to Coleman 2" snout modular spindles and PCR 5-on-5 race hubs at the front of the car. Pushrods extend from all four corners, mating to custom-fabricated bellcranks and then onto PSI-built Ohlins TTX36-double adjustable coilovers with Eibach ERS springs. 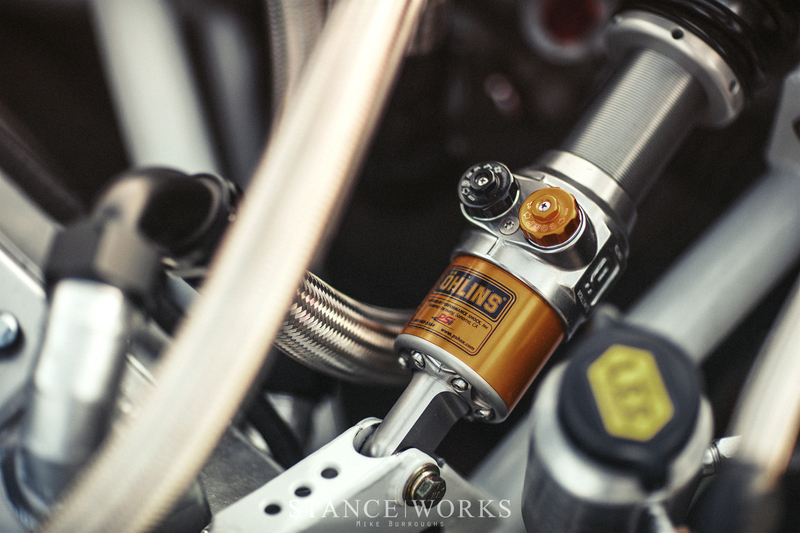 Mounted inboard and longitudinally, the Ohlins coilovers and their actuating components are a sight to behold. 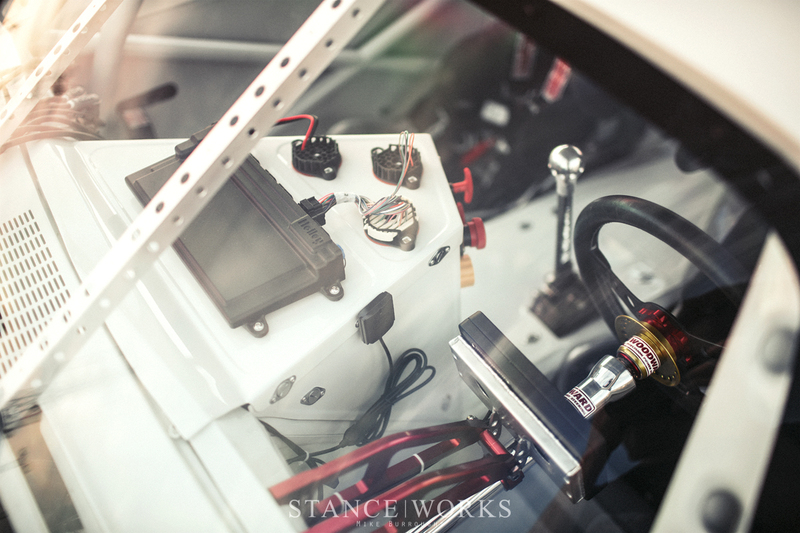 Speedway Engineering adjustable splined swaybars balance things out front and rear, and rounding out the running gear is a custom Woodward quick ratio power steering rack, paired with a PSC power steering pump and remote reservoir. If it wasn't apparent by this point, no expense, monetary or otherwise, was spared in building this machine. That includes the rest of the running gear, too. As a focal point, a set of new-old-stock Panasport C8-16s, measuring out to 16x12 square, were sourced by Riley: a one of a kind find. 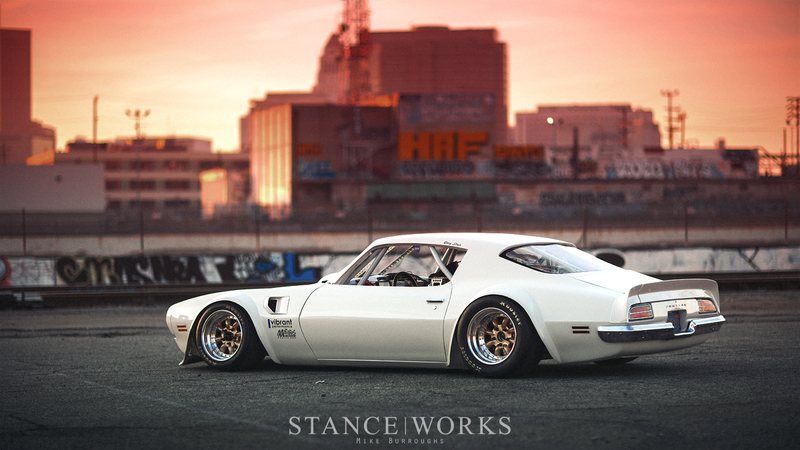 Perfectly suited to tie in the Trans Am racing roots of the car on the aesthetics side, while sporting some massive widths right out of the box, made the wheels a truly unique score. 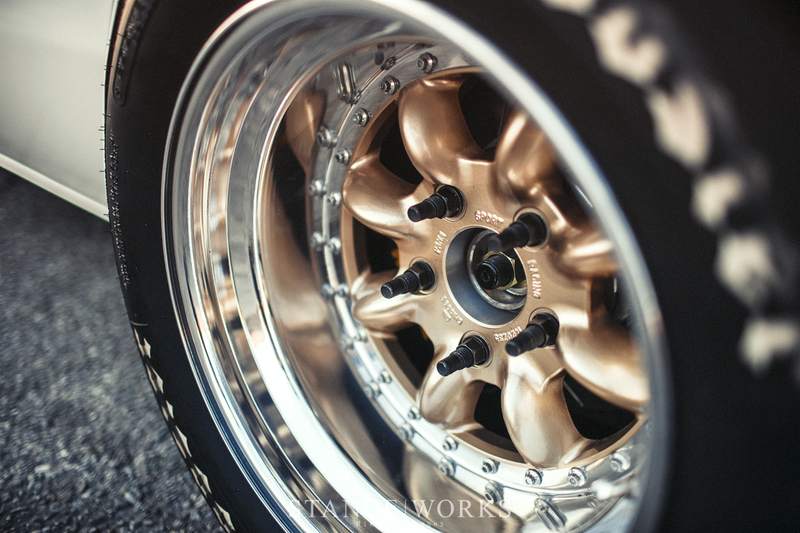 Wrapping the Panasports is a set of 23.5x12r16 and 25.5x12.5r16 Hoosier Radial Slicks, front and rear respectively. 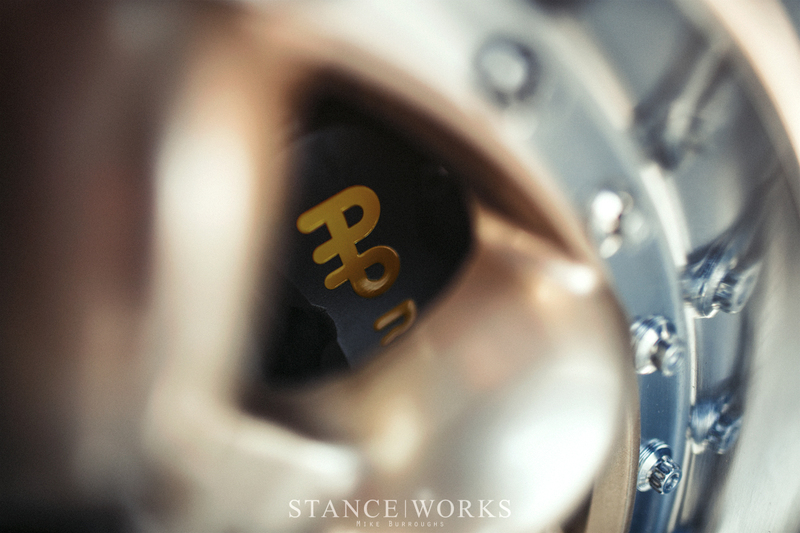 Hiding behind the golden spokes of the Panas is a set of 2-piece slotted, vented rotors at each corner, and grabbing them are AP racing calipers, 6 pistons in front and 4 in the rear. Hand-made aluminum shrouded brake ducts back the brake package, and ducting is supplied via the front air dam and NACA ducting in the rear window. The AP brakes provide the stopping power for the driveline, which, much like the engine, is comprised of some serious firepower. A 5.5" sintered metallic triple-disc Quartermaster clutch and starter ring assembly are mounted to the back of the billet crankshaft, and are capped by a Quartermaster aluminum bell housing. A TEX T101A 4-speed straight-cut dogbox backs the engine, having been pulled straight from a NASCAR cup car. It's undoubtedly able to withstand the immense power output, and happily delivers power through a custom driveshaft with 1350 Spicer joints. 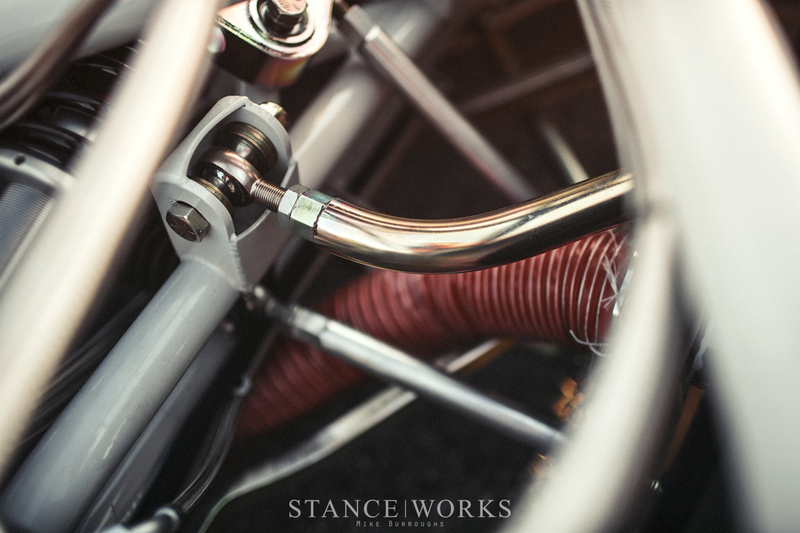 Custom G Force axles deliver power to Riley's hand-made rear uprights, and out to the Hoosier slicks. 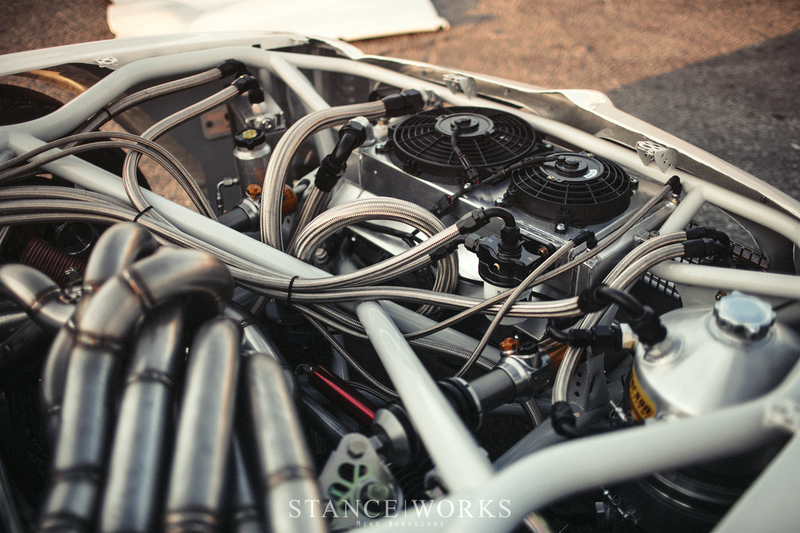 Inside the Trans Am, the insanity continues. 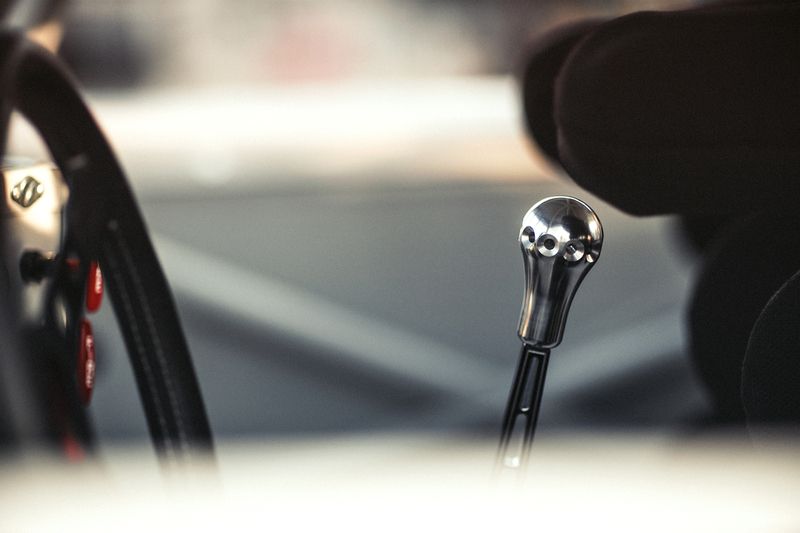 Beadrolled aluminum panels finish the interior of the car, with DZUS fasteners affixing them to the tubework. The quarter-turn fasteners allow access to all of the car's plumbing and electrical work for easy fixes and maintenance. The beadrolled panelling continues to the door cards, which feature Simpson door pulls that engage the factory mechanism within the doors themselves. 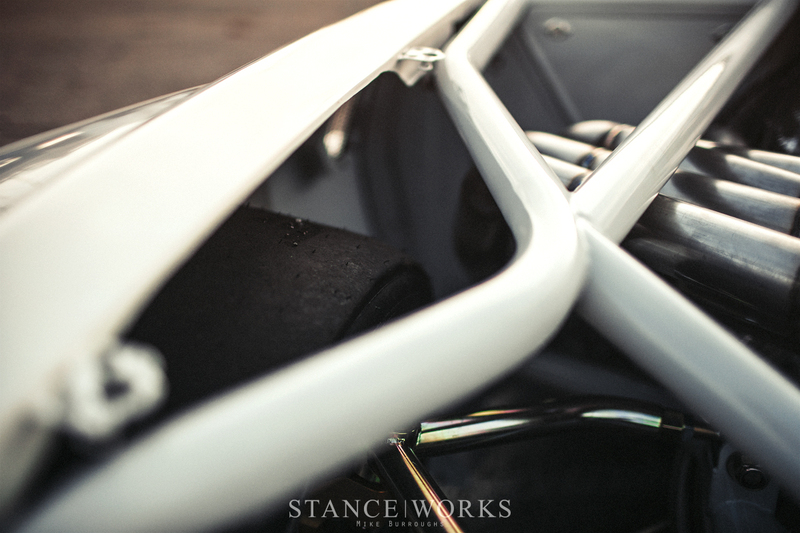 Kirkey full containment seats are present for both driver and passenger, with their all-aluminum construction helping to keep the car's weight to a minimum. Beautiful parts are scattered throughout: a Woodward steering column and quick release, a MOMO Prototipo wheel, a Holley digital dash, a Hurst shifter and a Rennstall shift knob to name a few. A trio of ARC switch panels point towards the driver for easy access, and the relay blocks are on display on the opposite side. 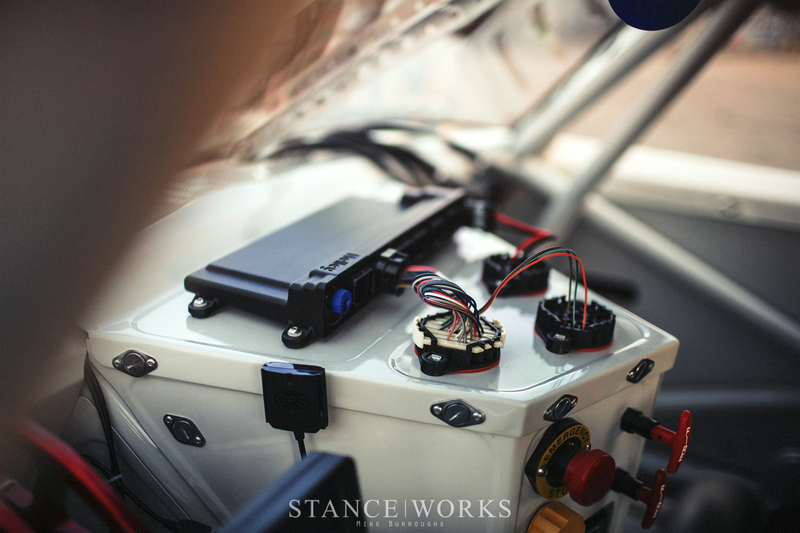 The Holley ECU sits atop the dash, and the wiring passes through bulkhead connectors for a clean but industrial-looking aesthetic. Simpson harnesses keep Riley and a passenger in place and contained in case of the worst, and for added safety, two five-pound Safecraft Halon fire suppression bottles are on board and plumbed throughout the car. On the floor is a Tilton pedal assembly, with 7/8ths Tilton masters for the brakes and clutch. 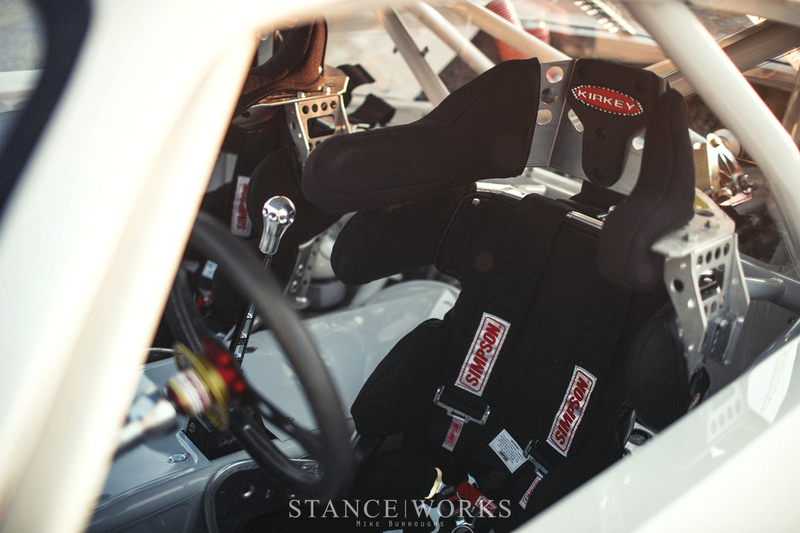 A brake bias adjustment knob gives Riley the control to fine-tune his setup, and Howe Racing reservoirs sit perched next to the steering wheel for easy access and supply. 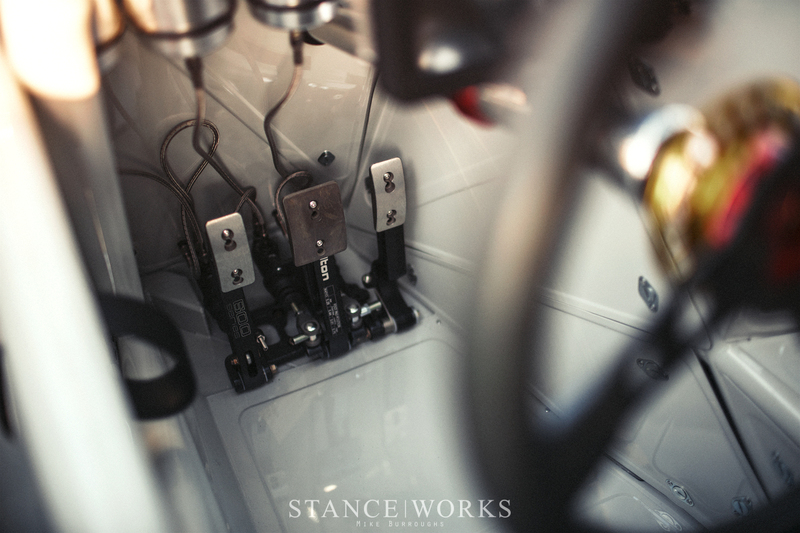 Opposite the pedals, in the passenger footwell, are the Holley Smart Ignition coils, mounted inside to escape the intense heat of the pro-stock motor. 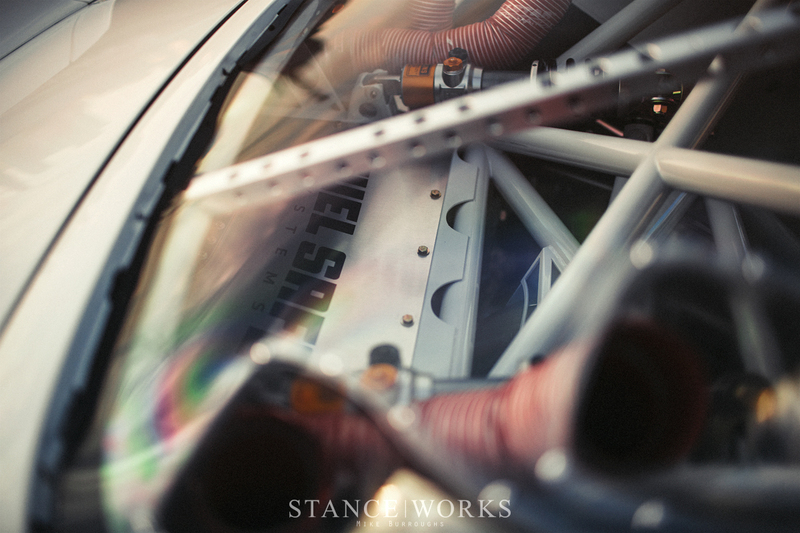 Behind the seats, a beautiful aluminum beadrolled firewall/bulkhead extends up to the belt bar, and above it, Lexan panels separate the driver compartment from the exposed rear section of the car. 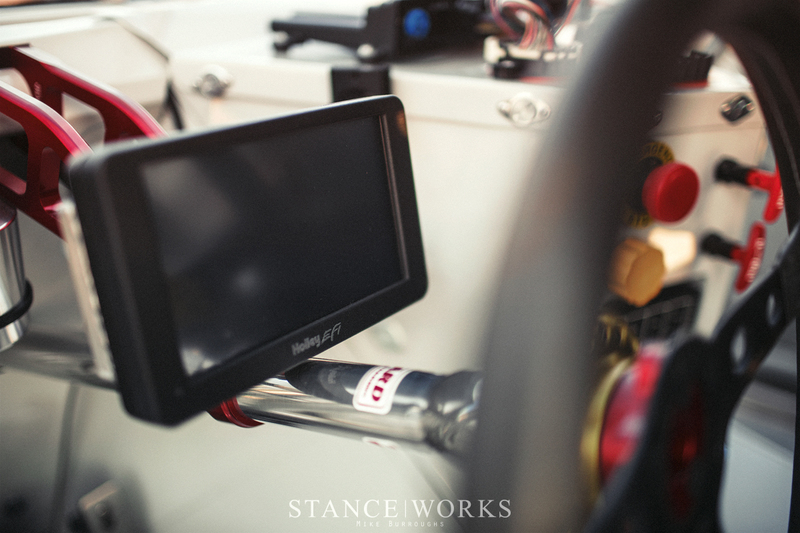 A simple glance through shows off all the incredible components as well as the incredible work and craftsmanship. With the foundations and components out of the way, that leaves the bodywork and finish work: everything that defines the car at first glance. 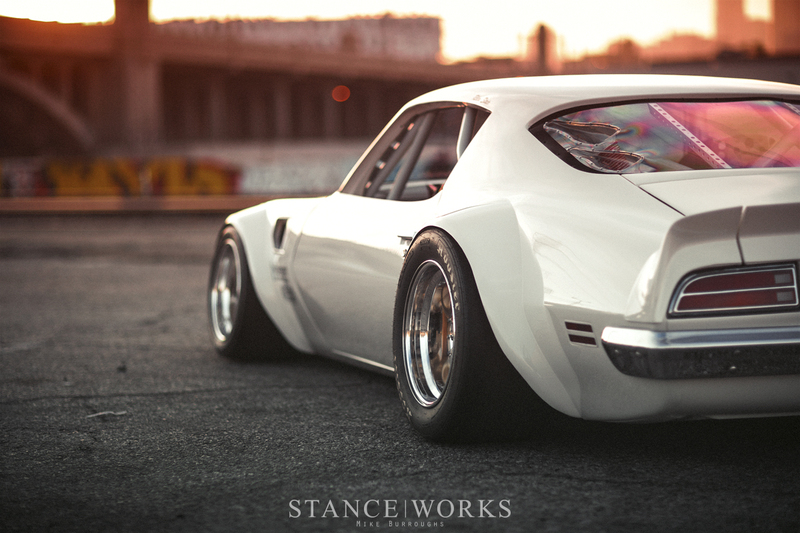 At the beginning of the project, Riley separated the Trans Am's skin from its original body, leaving just a single layer of sheet metal to work with. He conquered the rust repair and replacement panels before TIG welding the body to its chassis for final construction. As one of the final steps before its grand SEMA unveiling, the car was delivered to Performance Powder Coating and Stripping in Orangevale, California, where the entire car was powdercoated light gray for the chassis and insides, harking back to the grays often found inside vintage Trans Am racers. From there, the car was sent to Bug's Collision for paint, where it received an incredible coat of Ermine White, which elegantly highlights all of the custom work Riley put in to make the body all his own. All-metal fender flares, shaped by Riley himself, extend out at each corner of the car. A hand-built aluminum air dam bridges the front, and brings the car's nose panel just an inch or so from the pavement. More nuanced details, such as moving the Trans Am fender vents back nearly five inches to make way for the bigger fender flares, are worth noting, too. 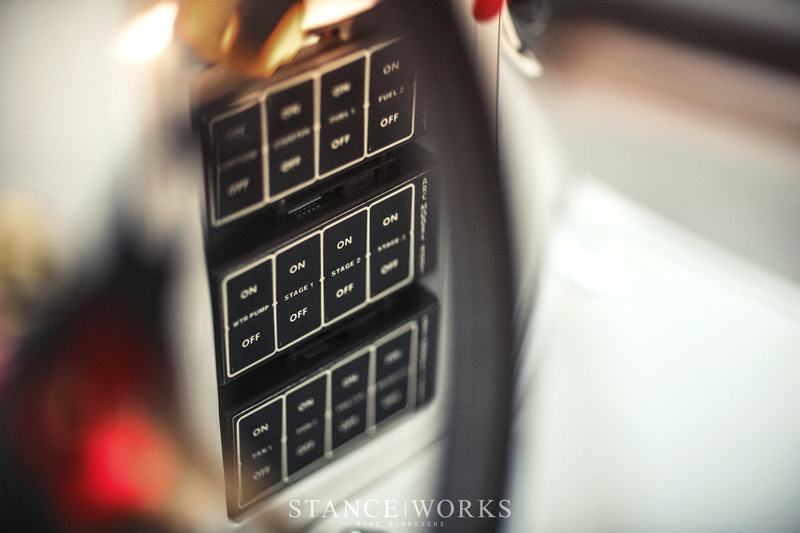 The tops of the doors were capped and molded, nixing the option of side glass in favor of clean, simple race-car aesthetics. The shaker hood scoop was moved to the rear of the hood to match the engine setback and give clearance to the intake, offering an OEM-plus take on the bodywork. A new rear bumper, tail lights, marker lights, grilles, door handles, latches, weather stripping, and more were all installed following the paint work, helping to bring the car to life. 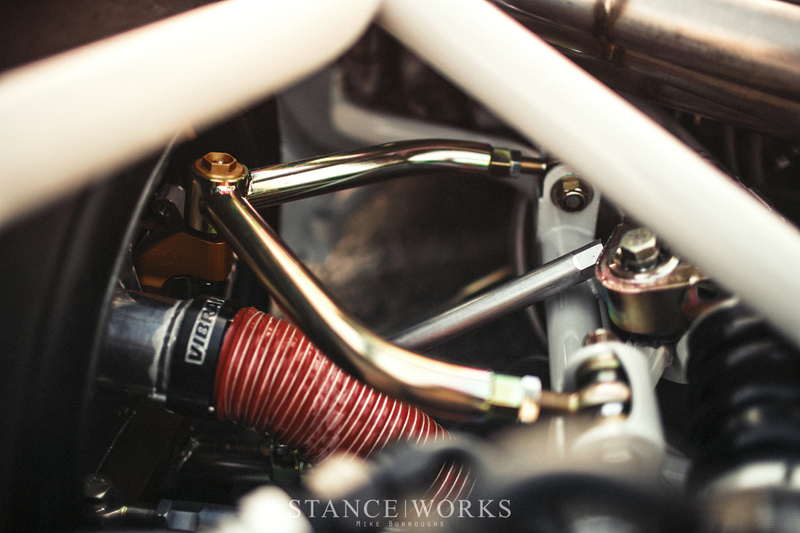 The incredible level of finish work continues throughout the car too, with all of Riley's custom hand-fabricated suspension components receiving a gorgeous yellow zinc-plated finish. Quite literally, no bolt was left unturned nor unpolished in the quest to build the best car he could. The sentiment of the project has been, from its inception, for Riley to push his talents to the limit, in every aspect, big or small. 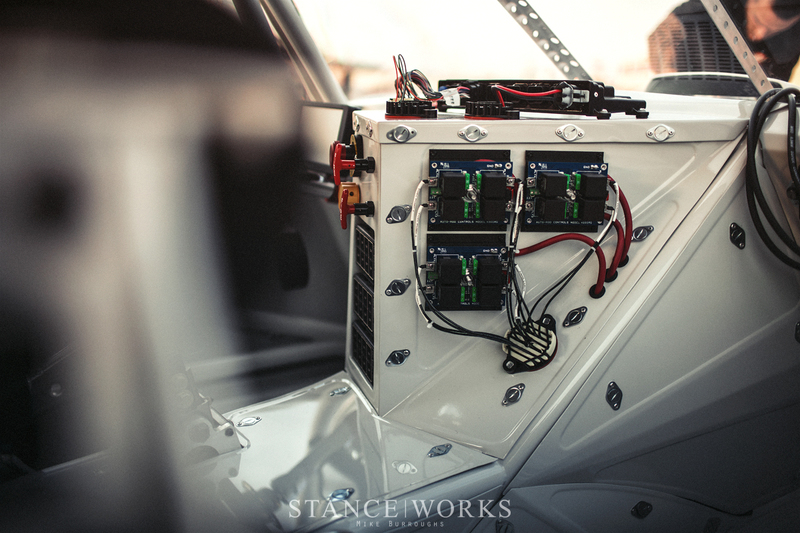 From the smallest brackets and tabs to the biggest aspects of the build itself, Riley gave this project ten tenths in an effort to showcase his talents and show the world of custom cars exactly what he's capable of. We'd say, with good reason, we're calling it The Benchmark. Go and do better. We dare ya.